Does Religion Cripple Science Innovation? Tyson here spoke in broad terms without naming any names. While there are some who believe in creation who wish to force creation being taught in schools, we at Answers in Genesis have never advocated that, nor would we. On the other hand, Tyson claimed that there are no atheists demanding control over what is taught in Sunday schools. But there are some who have suggested such a thing. Richard Dawkins has equated teaching children about creation with child abuse. Bill Nye has strongly warned against teaching children about creation, saying that it is okay for adults to believe in creation, but don’t you dare teach your children that. These statements are meaningless if they are interpreted to give a free pass to what is taught in Sunday schools. Imagine Dawkins and Nye saying, “Don’t you dare teach your children about creation, unless it’s in church.” No, their proscribed prohibitions are not restricted in this way. Furthermore, the likes of Tyson, Dawkins, and Nye would make any consideration of God forbidden within a discussion of science. Sir Isaac Newton, who literally wrote the book for the disciplines of astronomy and physics, clearly thought that the discussion of God was relevant to the discussion of science. I’ll trust the judgment of Sir Isaac on this. There is not a bit of science in that statement. When Sagan said it 34 years ago and then wrote it in his book, a lot of people were saying, “Wow! What a profound scientific statement,” but it’s actually a philosophical statement. It is denial of the supernatural, saying the only thing that exists is the physical world, the natural world. But to say that with any certainty Sagan had to get outside the physical universe and see that the physical universe is all that there is. And he would have had to do that in eternity past and in eternity future in order to say that. If he could really see that, then he would be god. It’s a very bold, metaphysical statement. It’s an assertion. But it’s not science. It’s not a scientific statement. The “religious philosophy” of evolution, despite a complete lack of experimental evidence to demonstrate life evolving from non-living elements through random processes—something Tyson admits in Cosmos—maintains that life evolved through natural processes. Tyson’s religion of evolution, despite a complete lack of experimental evidence to demonstrate living organisms evolving into new, more complex kinds of organisms, maintains that such natural processes produced the biodiversity we see on the earth. Tyson, during the Cosmosseries, directly attacks biblical belief as ignorant superstition while praising the work of many Bible-believing pioneers in science (like Isaac Newton, Michael Faraday, William Herschel, etc.) who sought to uncover the natural laws that they trusted their wise Creator God would have put in place to govern the universe He created with consistency, orderliness, and predictability. Bible-believing scientists do not “substitute” their religion for science. But they do trust that the universe they study using the tools of science was created by a logical, wise God and that He has told us some things about His Creation in His Word, the Bible. While it is possible and even common for fallible human beings to misinterpret both scientific data and the written word, Bible-believing scientists understand the correct interpretation of accurate scientific data will never conflict the correctly interpreted ( 2 Timothy 2:15 ) Word of God. The Word of the Creator God explains how the existence of consistent laws of science only makes sense in the context of a universe created by God. God created the laws of nature; they did not create themselves. Without those God-created natural laws, the scientific method would be useless because experiments could never be trusted to yield consistent results. While Answers in Genesis does not advocate requiring creationism be taught in public schools, we do maintain that students and teachers who are allowed the academic freedom to critically examine the claims of evolutionists will better understand the distinction between worldview-based assumptions and observable facts. Such critical thinking skills may, evolutionists fear, lead some students to discern the opinion-based foundation of claims. This understanding of science should make students better scientists. Perhaps they will be equipped to avoid mistakes such as the presumption that certain human organs are useless evolutionary vestiges of no use. Perhaps they will be better equipped to see that a human embryo is not just an unborn animal to be culled at will through abortion. These are clearly academic advantages to allowing “a divine foot in the door”3 of the science classroom rather than arbitrarily assuming that science cannot have had a supernatural agent involved at the foundation of the orderly natural universe in which we live. But the ultimate answer to Tyson’s question about the motivation of Bible-believing Christians in caring about science education reaches beyond the classroom to life, and beyond life in this world into eternity. We believe all people should be allowed to hear the truth about how the biblical account of our history actually fits the facts of observable science. We speak out and write reviews and answer questions because evolutionary scientists loudly proclaim that the Word of God is false, that the God of the Bible is nonexistent or a liar, and that people who believe in them are intellectually inferior. They thus place stumbling blocks ( John 5:46–47 ) in the path of those who would eternally benefit from faith in Jesus Christ, the Son of God, our Creator ( Colossians 1:16–17 ) and the Savior of all who repent and put the trust in Him for salvation from sin and guilt. Though in this interview Tyson uses a general term, “religious philosophy,” in many of the episodes he specifically targets Bible-believers with emphasis on those who believe the earth is about 6,000 years old, i.e. 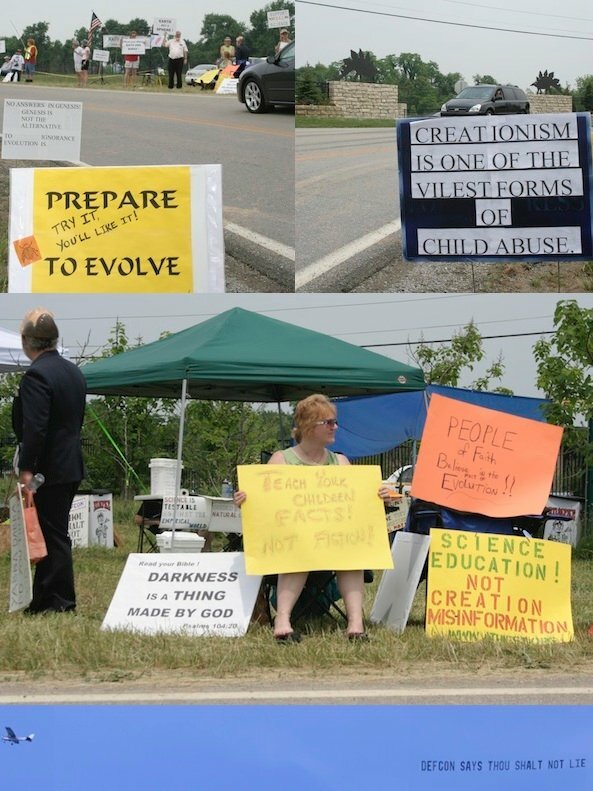 young earth creationists. Billy Hallowell, “‘Cosmos’ TV Host Says Scripture Isn’t a Scientific Source: ‘Enlightened Religious People . . . Don’t Try to Use the Bible as a Textbook’,” The Blaze, March 11, 2014, www.theblaze.com/stories/2014/03/11/cosmos-host-says-scripture-isnt-a-scientific-source-enlightened-religious-people-dont-try-to-use-the-bible-as-a-textbook . Evolutionist Richard Lewontin wrote: “Our willingness to accept scientific claims that are against common sense is the key to an understanding of the real struggle between science and the supernatural. We take the side of science in spite of the patent absurdity of some of its constructs in spite of its failure to fulfill many of its extravagant promises of health and life, in spite of the tolerance of the scientific community for unsubstantiated just-so stories, because we have a prior commitment, a commitment to materialism. It is not that the methods and institutions of science somehow compel us to accept a material explanation of the phenomenal world, but on the contrary, that we are forced by our a priori adherence to material causes to create an apparatus of investigation and a set of concepts that produce material explanations, no matter how mystifying to the uninitiated. Moreover, that materialism is absolute, for we cannot allow a Divine Foot in the door.” From Richard Lewontin (Harvard University geneticist), “Billions & Billions of Demons,” New York Times Book Reviews (9 Jan. 1997), p. 31 (italics in the original). The review is of Carl Sagan’s book, The Demon-Haunted World: Science as a Candle in the Dark (Random House, 1997).